During the Ignite Conference 2016, Microsoft has shown several new features for users with businesses, many of which are mainly related to Office 365. The Redmond company has described all structural changes designed to improve access to mail services through the Outlook application for iOS and Android, now fully based on Microsoft cloud. 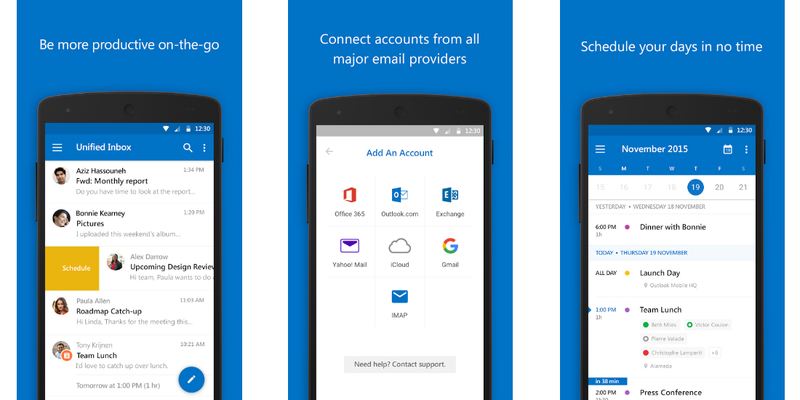 New versions of Outlook seek to better meet the needs of enterprise customers on iOS and Android. Using Microsoft cloud allows adding support for Exchange Online. All mailboxes are managed natively and no data stored externally to Office 365. The emails are protected by a TLS connection from end-to-end between Office 365 and Outlook application. The famous mail service uses a component called "stateless translator protocol" running on Azure, which routes data and translates the commands (from Outlook Device API to REST and vice versa) between Outlook and Exchange Online without storing user data. The new application architecture also improves how Outlook connects the Device ID to Exchange Online. The administrator can then locate the devices accessing the service, thanks to the indication of the name of the smartphone or tablet and operating system installed. All these new features are available in Enterprise, Business and Education editions of Office 365, but will extend to all customers in the coming weeks. The new Outlook application for iOS and Android will replace Outlook Web Access for iPhone, iPad and Android, which will be removed from the app stores later. Outlook for Windows 10 Mobile continue using Exchange Active Sync to connect to mailboxes of Office 365.